The National Institute of Water and Atmospheric Research (NIWA) in New Zealand has been using Hydro2de for the last 10 years. After trialling it on of a wide range of gravel-bedded braided river reaches (mean flows of 3.4 to 100 m3/s) and a large sinuous single thread river (mean flow 291 m3/s), NIWA found Hydro2de to be robust software giving good results. NIWA has since used Hydro2de to predict depths and velocities for a wide range of flows in braided gravel-bed rivers. Much of his work was to predict changes in physical habitat using instream flow incremental flow (IFIM) principles for a wide range of species and life stages from benthic invertebrates to salmonid species and including the feeding habitat of riverbed nesting birds. NIWA has also used Hydro2de to predict flood plain inundation on the river with the highest peak flood flows in New Zealand (Buller River - peak flow 12,500 m3/s). Currently (austral winter 2005) NIWA is carrying out a flood plain inundation study on the largest river in New Zealand (Clutha River mean flow 614 m3/s). A heavy rainfall event in an torrent catchment in an district of Salzburg (Austria) caused a flood disaster in summer 2002. 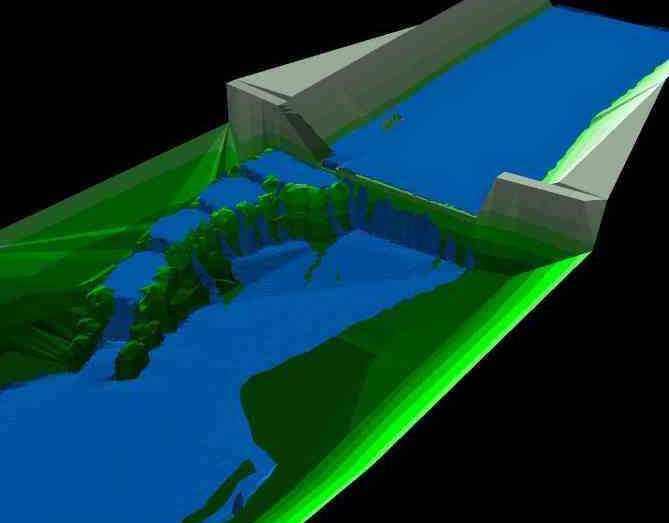 With the help of different simulation models (1D and 2D) the influence of a dam break on the extend of the flooding was investigated. Flumen was used to calculate the hydraulic conditions during the event. The animation created with Flumen represent the situation with overtopping on the second retention basin. In the rhithral solid-walled torrential barriers with a fall height of over 50 cm and flush longitudinal structures have a particularly strong effect on the potential of migration for fishes and other aquatic organisms. Flow velocity, fall height and flow depth are important parameters for the operability of such measures. Conventionally they only can be estimated with large uncertainty. 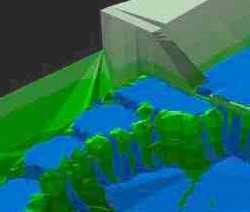 Hydrodynamic modelling can be an efficient method for testing such structures under various flow conditions. 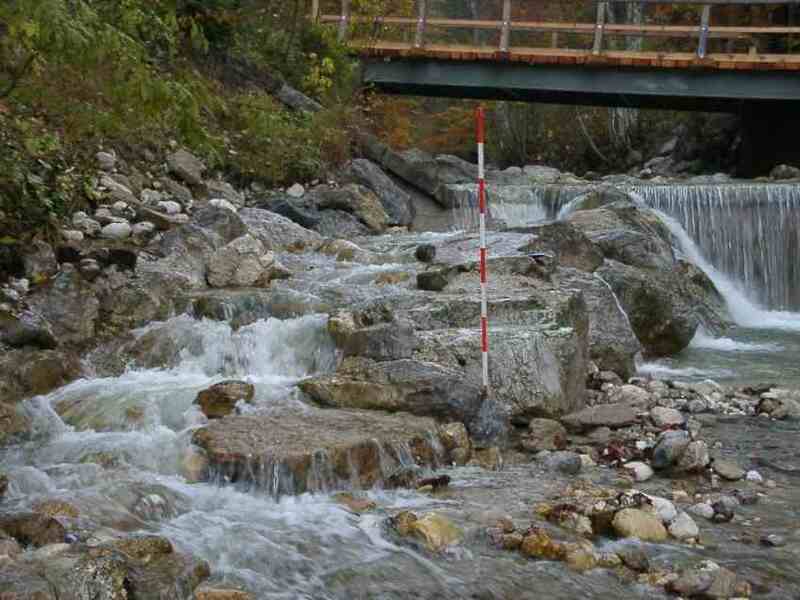 We have used FLUMEN to predict the necessary flow depth and flow velocity for different flow conditions for a given rough-channel pool pass in Austria and compared the results with observations on site. The comparisons showed a good agreement between nature and simulation result. Slide 1 (18 KB) shows a 2,5D-View created with ArcView3.2 of a Flumen simulation-run with an discharge of about 0,5 m³/s at a particular time. Slide 2 (55 KB) shows the situation on site. 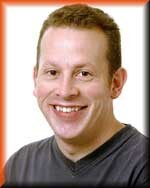 Andrew Nicholas, PhD. Department of Geography, Exeter University, UK. "Staff and postgraduate research students within the Geography Department’s Hydrology & Earth Surface Processes Research Group at Exeter University are using Hydro2de to model flow hydraulics in a wide range of fluvial environments including lowland floodplains and high gradient braided rivers. Hydro2de has proven to be ideal for use in such applications owing to its accuracy, robust performance and ability to simulate complex flow patterns in situations involving extremely complicated river bed and floodplain topography." 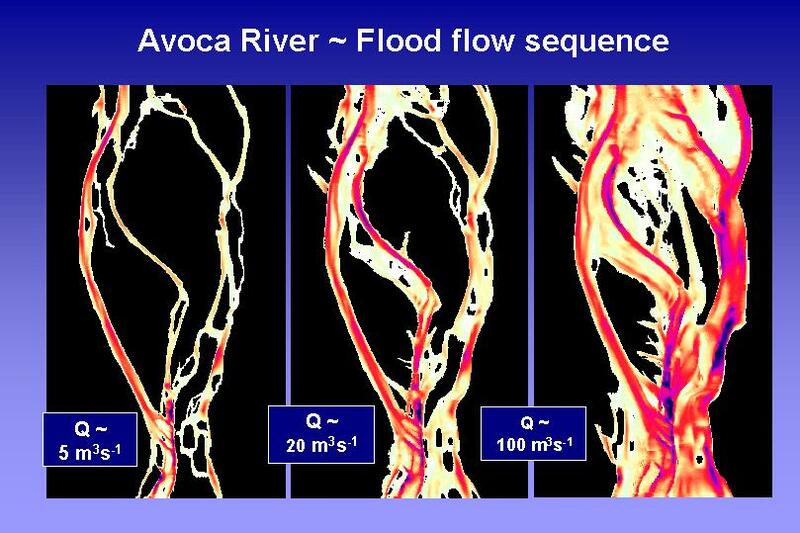 Slide 1 (75k) shows predicted flow depths on the floodplain of the River Culm, Devon, at three discharges. 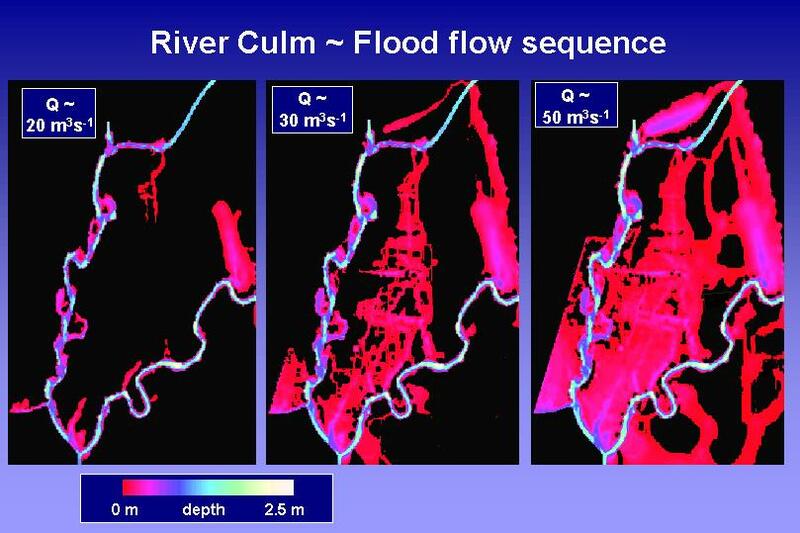 Slide 2 & 3 show combined flow depth and velocity vector predictions for small areas of the River Culm floodplain and illustrate the ability of hydro2de to simulate flow patterns in complex environments. Slide 2 (100k) shows flow across a point bar inside a meander bend. 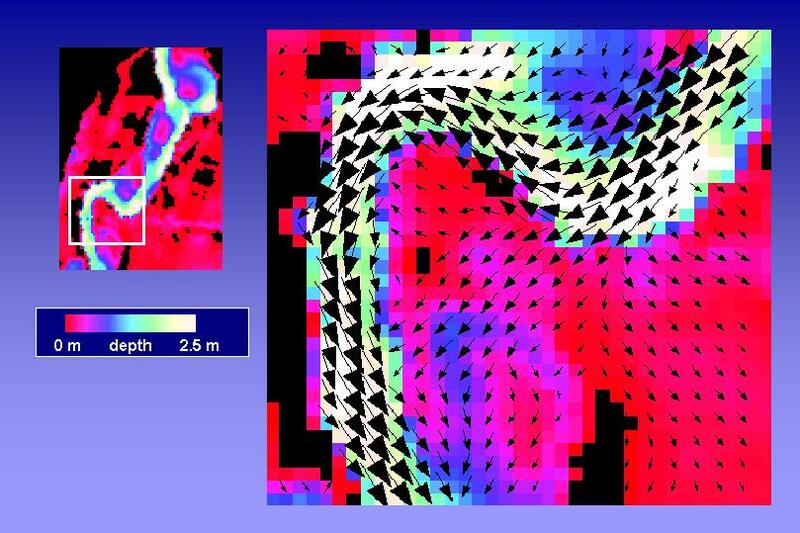 Slide 3 (87k) shows a flow recirculation zone within an abandoned channel. Slide 4 (89k) shows patterns of predicted unit discharge for the braided Avoca River, New Zealand, at three discharges. These predictions have been validated against field measurements of flow depth and velocity, and against inundation extent maps derived using GPS surveys. The high degree of correspondence between Hydro2de output and field data has also allowed us to use these predictions as the input to numerical models of suspended sediment transport and deposition. "In the downstream section of the barrage Iffezheim at the River Rhine massive erosion problems exist. Artificial grain feeding is used to prevent severe erosion of the river bed. Nevertheless, the groynes in this river section are eroded and have to be reconstructed from time to time, what causes very high costs. We have used Hydro2de to predict the reduction of bed shear stresses subject to length reduction of the groynes. 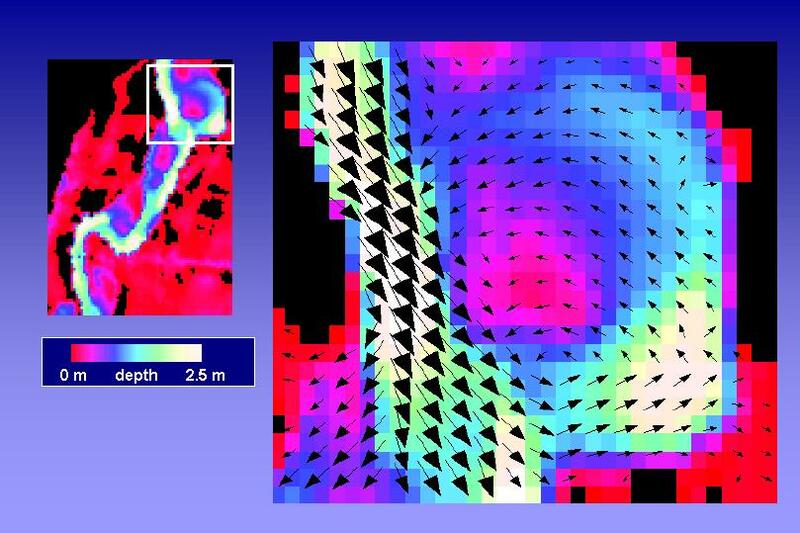 Digital elevation data from high accurate survey was used as input data for Hydro2de. Comparing the calculation results (e.g. water levels) with the surveying data showed very good agreement, while using close to nature calibration parameters (e.g. Manning-Strickler coefficients)." "After 15 years of modelling flooding on the Canterbury Plains of New Zealand I have found Hydro2de gives a big leap forward in the solution of these problems. The flood plains are complicated and I was not confident about the results from the existing 1D models I was using in many areas of the flood plains and stopbank design on our river control schemes. We give out 100's of flood assessments every year to people purchasing farms or building houses (requiring floor levels for construction) on the flood plain. The results from Hydro2de will greatly improve the accuracy and quality of the information we provide." The modelled area covers approx. 50 sqkm of the Waihao river flood plain (New Zealand). Hydro2de has been used to estimate the flood depths in an area of 15 sqkm near the shore. The size of the grid cells is 20x20m. In his thesis Rob Connell has evaluated the different error sources and compared the modelling results with observations made by the flood plain residents. More details can be found at Environment Canterbury.